The Midland Resource Recovery OdorTracker is an automated odorant-monitoring system that is suitable for permanent or temporary odorization installations. The OdorTracker is ideal for monitoring odorant levels at remote locations and available for Class I Div 1 and Class I Div 2 hazardous locations. The OdorTracker unit provides evidentiary documentation for risk management. 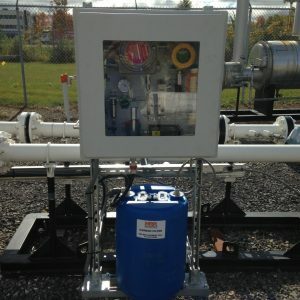 This system samples gas from the pipeline at regular intervals and logs the odorant levels in flash memory which can be downloaded locally or remotely. The communications module, which is an option for these units, presents the data in a trend chart on a password-protected web page which is visible on both computers and phones. The in-unit communication system has the ability to send data and alarms via email and/or text message or can be extracted locally. The Odortracker is capable of establishing preset alarms for both high and low levels. The OdorTracker unit is available for purchase or for both short and long term lease.